Ulrich Alexander “Rick” Fox was born on 24 July 1969, in Toronto, Ontario Canada, of Bahamian (father) and Italian and Scottish (mother) descent. He is a former basketball player with such NBA teams as the Los Angeles Lakers, and is now an actor and businessman. So just how rich is Rick Fox? Authoritative sources have estimated that Rick has a net worth which grosses over $20 million, as of mid-2016, accumulated during his basketball and acting careers over a period of 25 years. Rick was schooled in the Bahamas and Warsaw, Indiana, making the Indiana All-Star team in 1987, and after matriculation enrolled at the University of North Carolina, leading the basketball team to the 1991 NCAA Final Four, before graduating with a BA degree in radio, television and motion pictures. From 1991 to 2004 Rick played basketball professionally in the NBA league. being selected the 24th pick in the first round of the 1991 NBA draft by the Boston Celtics, and signing a contract which put a significant amount of money into Fox’s net worth. He played for the Celtics until 1997, being named into the First team All-ACC in 1992, and NBA All-Rookie Second Team in 1993. Then from 1997 to 2004 Rick played for the Los Angeles Lakers, and Rick’s net worth rose after he was part of the team which won three NBA championships in three successive seasons from 2000-02. Fox also played for Canada at the FIBA World Championships of 1990 and 1994. In addition to being professional basketball player, Rick has also increased his net worth as an actor. He retired from playing at the end of the 2003-04 season, already having his finger in the acting pie. He had debuted on the big screen in the film “Blue Chips” directed by William Friedkin in 1994, and later had some small roles in the comedy “Eddie” directed by Steve Rash, the drama “He Got Game” written and directed by Spike Lee, the thriller “Resurrection” directed by Russell Mulcahy, comedy dramas ‘Mini’s First Time’ film written, directed by Nick Guthe and “Tyler Pery’s Meet the Browns” directed by Tyler Perry and other films. From 1997 to 2003 Rick appeared in the episodes of the drama series ‘Oz’ created by Tom Fontana, increasing his net worth somewhat as it was a rather significant role in the series. Moreover, he had roles in the television series ‘Missing’ created by Glenn Davis and William Laurin, ‘Kevin Hill’ created by Jorge A. Reyes, ‘One Tree Hill’ created by Mark Schwahn, ‘Ugly Betty’ created by Fernando Gaitán and other television series. In addition to being a great feature film and television series actor, Rick Fox has increased his net worth appearing in other television productions. In 2010 Rick was paired with professional dancer Cheryl Burke to win sixth place in the television show ‘Dancing With The Stars’. Furthermore, Fox took part in the television show ‘Are You Smarter Than A Fifth Grader?’, and successfully hosted five episodes of ‘The Jace Hall Show’, plus Fox increased his net worth by appearing as a judge in the reality competition series ‘RuPaul’s Drag Race’, directed by Nick Murray. Rick has also become involved as a businessman by purchasing the video game team now called Echo Fox in the North American League of Legends Championship Series. In his personal life, Rick Fox became a father for the first time while studying at college, a son with girlfriend Kari Hillsman. In 1999 he married his first wife famous actress and singer Vanessa L. Williams. with whom he has a daughter, however, in 2004 the couple divorced. Later, Fox was in a long term relationship with an actress Eliza Dushku, however, the couple separated in 2014, and Rick is supposedly single, for the moment. Movies "Body of Proof" (2012), "Hit the Floor", "Sharknado 3: Oh Hell No! ", "Resurrection" (1999), "Holes"
TV Shows "Oz" (1997-2003), "To Your Health", "Revenge is Sweet", "Exeunt Omnes", "The Fairly OddParents", "Dancing With The Stars", "Crime Wave/Odd Ball", "One Tree Hill", "Tyler Perry's Meet the Browns"
4 Was in a relationship with Eliza Dushku from 2009 to 2014. 5 Ex-brother-in-law of Chris Williams. 6 Worked with acting coach Peter Kelley. 7 Has a younger sister, Jeanene Fox, famous for her sarcastic role as "La Filippona" on the prime-time Italian Television Show Striscia la notizia (1988). 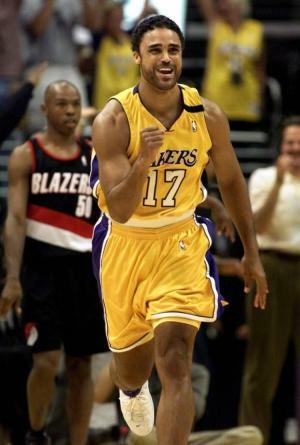 8 Wears #17 for the Lakers for two reasons. He said that while with the Celtics, he entered training camp every year with the goal of helping them win their 17th NBA Championship. Another reason for wearing the number is due to the comparisons to Celtic great John Havlicek. 9 He and Vanessa Williams eloped to the Caribbean in the summer of 1999, but promised family and friends they'd re-tie the knot that fall, which they did in a lavish ceremony at the Church of the Holy Trinity in New York followed by a gala reception at the St. Regis Hotel. 10 Daughter, Sasha Fox, with Vanessa Williams, was born 1 May 2000. 11 He was introduced to his former wife Vanessa Williams by then-girlfriend, supermodel Tyra Banks. When his romance with Banks ended, Fox and Williams began dating. 12 Has a son, Kyle, by college sweetheart Kari Hillsman. 14 Became the first Boston Celtics rookie to start on opening night since Larry Bird in 1979.